One goal of the National Law Enforcement Museum has always been to represent the diversity of American law enforcement, both in the individuals who serve and the jobs they do. One exhibit, called Being an Officer, does just that by examining different types of specialized units, including Corrections, Bomb Squads, K9 Units, and SWAT Teams. The SWAT section will be especially exciting, giving visitors an inside look into this inherently intense and action-packed job. With the push of a button, an otherwise peaceful scene quickly becomes a dangerous situation that requires the intervention of tactical officers--and visitors get to watch as the action unfolds. This 90-second two-story projection demonstrates the professional and efficient tactics used by SWAT to control a high-risk situation and ensure the safety of everyone involved. To get the full picture of SWAT, visitors will learn how long tactical officers have been around and how they came into being. Many people do not know that tactical teams began to develop in response to a number of violent incidents that had occurred across the United States during the 1960s. Single-shooter incidents—such as the Texas Tower Shooting in 1966—had an impact, but SWAT was established mainly in response to the growth of armed, well-organized militant groups like the Black Panthers and the Symbionese Liberation Army. This look at history combined with descriptions of duties and significant turning points in the profession will make for an exhibit that will grab visitors' attention and teach them something about what being a tactical officer really means. maximum security section of Lorton Prison for the Museum. 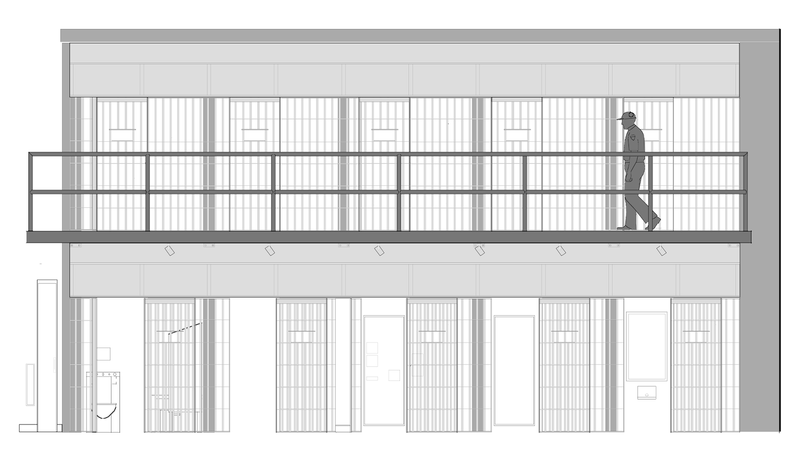 A design drawing of the two-story Maximum Security cells restored and re-created in the Museum. The Museum thanks Chris Caperton of Fairfax County’s Department of Planning and Zoning for allowing us to extract the cells at the right time during the County’s extensive redevelopment plan for the old prison and grounds. The National Law Enforcement Museum is proud to make the cells of Lorton a centerpiece of its exhibition on corrections officers.